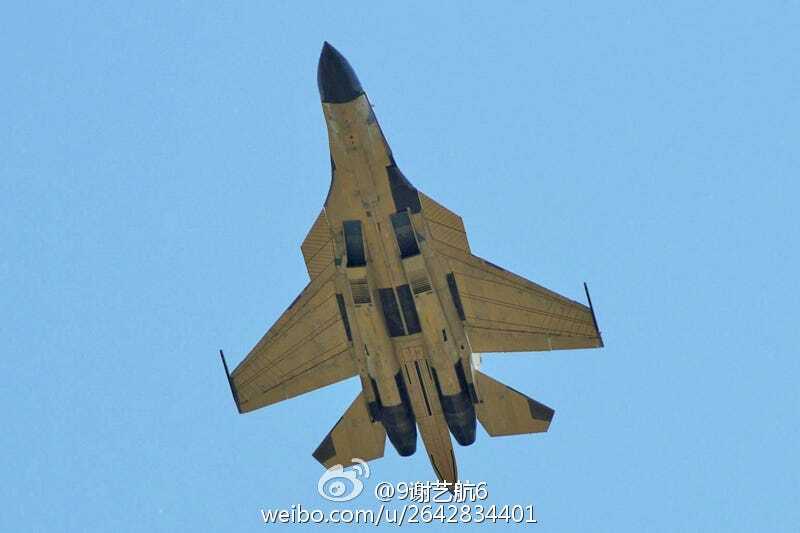 This image, posted on the Chinese website Weibo, shows what appears to be a Chinese Su-27 Flanker derivative very similar to Russia’s Su-34 Fullback fighter-bomber. The picture coincides with rumors that a new Chinese fighter type flew recently but we have no way to authenticate the image at this time. There is no prior indication that Russia has licensed Russian aircraft designer Sukhoi’s Su-34 fighter-bomber to China, but this has not stopped China from building its own Sukhoi clones before. Currently China has multiple indigenous Su-27 Flanker derivatives in production, including the Shenyang J-11B, a Su-27 knock-0ff and the carrier capable J-15, a copy of the Su-33 carrier-borne fighter. It is widely understood that China received a single Su-33 airframe from Ukraine around the year 2000, from which the J-15 was directly modeled. China also flies Russian-built and officially licensed versions of the Su-27 as well. If this photo is indeed legitimate, this aircraft does look like a close copy of the Su-34. Key features are present including its platypus nose which is optimized for side-by-side seating and broad radar aperture. A “stinger” style tail boom is also present, just as it is on the Su-34, along with canard fore-planes. Although, in this case, it looks like these fore-planes may be mated to the aircraft’s wing via a large leading-edge root extension plate. This is something that does not exist on Russia’s Su-34s. This could be a feature installed just for initial test flights, or it could be a unique Chinese feature. The idea that China may be developing a Su-34 knock-off is intriguing and it does fit their anti-access, area denial strategy, one in which short-ranged fighters have less utility than long-ranged ones. Its side-by-side crew layout is ideal for longer missions and its large radar aperture is useful for installing a powerful electronically scanned radar array with long-range air-to-air search and track capabilities and high resolution air-to-ground modes for attacking surface targets in littoral environments. This would give China a particularly well suited weapon for anti-ship missions and for long-range anti-aircraft operations. In particular, attacks on airborne warning and control, tanker and other support aircraft may be possible by lobbing long-range anti-radiation and anti-aircraft missiles at these targets. The same can be said for the anti-ship role, with the type known to be able to carry supersonic anti-ship missiles currently in Russia’s and China’s inventories. A Chinese Su-34 would be an ideal weapon system to be deployed to its burgeoning South China Sea bases, where it could patrol over large areas and have the sensor suite capability of surveying those areas and targeting ships at range if need be. Although there are no tell-tale signs that the mystery aircraft in the picture is carrier capable, this could eventually be the case. Russia envisioned and produced a tandem-seat flanker design long ago, well before the Su-34 Fullback was a reality. The aircraft was to be used as a trainer for its carrier-borne Su-33 pilots, familiarizing them with on how to operate the big Flankers in the carrier environment. To make it brief, towards the end of the Cold War, the Soviets produced the Su-27IB, the first Flanker derivative that featured side-by-side seating. Eventually, a derivative of this jet branched off to slowly become the land-based, duckbill-nosed Su-32/Su-34. The other version, after stagnation during the 1990s, would eventually be morphed into the Su-33KUB carrier combat trainer. Strangely enough, this aircraft, of which only a couple were built, was more advanced than the Su-33 itself, and worked as a hybrid testing and training aircraft. The Su-33KUB eventually included thrust vectoring to compensate for its heavier forward structure and to offer more forgiving handling around the carrier and it had an advanced cockpit and sensor and avionics suite, one even more advanced than the standard Su-33. If the supposed Chinese aircraft shown in the picture is intended to be a carrier-based strike aircraft and/or trainer, and China could not include an indigenous thrust-vectoring engine nozzle system, which they probably have not mastered technologically yet, the enlarged wing-root extensions may be there to compensate for the jet’s heavy nose. This extra degree of forward lift may be necessary to operate off the carrier, but for land-based versions it may be totally omitted as the jet’s normal trim and lift systems should be adequate. The truth is this aircraft could be all these things, a long-range fighter bomber for both ground and carrier uses, as well as a trainer aircraft for China’s J-15 fleet. Or it could be nothing at all. But at the very least, a ground-based Su-34 derivative may be just too logical for China not to pursue considering its strategic posture and current combat aircraft inventory. Such an aircraft could be an ideal replacement for China’s aging JH-7 fleet and could bridge the gap between the country’s fighter and long-range bomber forces.